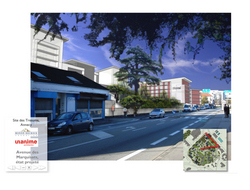 The Annecy conurbation as of spring 2008 will benefit from a brand new ultra-modern hospital centre. This new complex with 650 beds, constructed in the Bouvarde joint development zone at Metz-Tessy, will provide a centre for all the medical, surgical and obstetrics activities at present based in the Trésums site at Annecy. There will be no change for the psychiatric and geriatric establishments at Seynod and the St François Retirement Home at Annecy which will retain their present functions and remain strong partners of the new hospital. Reminder: planning permission for the new centre was obtained n February 2001 and work began in November 2002. After the hospital moves, which will take place over nine weeks, an undoubtedly impressive project will be undertaken on the initiative of the Toulouse promoter Monne-Decroix. The land on which the hospital stands belongs to the regional hospital agency which has sold it to a private owner…But, as mayor Jean-Luc Rigaut reminds us, “The project will have to respect the rules laid down by the city in connection with its PLU (Local Town Plan)”. Between now and 2011, 12 buildings, composing in total 140 low-rent homes and 488 with access to the property, will be created. And also a three-star hotel with 110 rooms to cater to the needs of the future Conference Centre which will be just opposite, and a private home for dependant old people with 110 rooms also. Parking, with 1000 places, will be underground, with limited access to preserve the landscape view of the site. The heart of the whole project, with one-third of the total surface area, will be made up of a large public park with pedestrian access from the Marquisats Avenue, as far as the Corniche Boulevard, with its viewpoints over the lake and the mountains….The roads around this new area will also be reorganised, but will bring only half the present traffic flow compared to the present hospital. Note in addition that the Director’s House will be preserved, as will be the symbol of the former hospices, the giant pelican, and the baptismal fonts of the little chapel which will be placed in the park. Not forgetting the beautiful cedar tree on the edge of the Avenue des Marquisats. The projects below strongly complement the individual programmes carried out by private or public constructors on small lots acquired directly from individual owners. In certain cases (Hirondelles Small Business Park, the Clos Jacquin at La Mandallaz and the Liberté Small Business Park at La Prairie), the construction companies themselves will carry out the development work. The Courier project, being the most spectacular in the town centre, the biggest in building-area, and with the work largely finished, is naturally the best known. The Parmelan Project, nearing completion, combines rearrangement of the public space of a working-class district of the 1950s, renewal of part of the inheritance of low-rent accommodation, partial demolition and reconstruction to widen the social mix based on new social facilities. The Mandallaz project, also nearing completion, has made it possible to use former industrial wasteland to offer 172 new homes and offices. This has been backed up by the Clos Jacquin project (119 homes for sale). 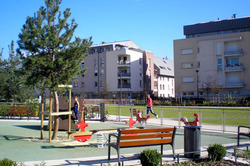 The Hirondelles project, with a capacity of 150 homes, will be completed by the building of a final apartment bloc of 35 homes and by the extension of a public garden. The Galbert project will provide for 450 homes near the town centre. 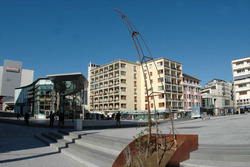 The new office of the Haute Savoie Chamber of Commerce and Industry (CCI) opened its doors in 2003 in the same district. The land around is in the process of being sold for further buildings. The La Prairie district Project. The Jardins project is in process of being carried out. With a capacity of 130 homes, only 23 homes remain to be sold. The choice of promoter for this last construction will be made as soon the old building on the chemin de la Prairie is free.